The new Hilton Hotel at the Ageas Bowl has finally been opened after a long and troubled genesis which included companies going bust and a council bailout during the construction phase, but it promises to be unique and unrivalled lesisure facility. 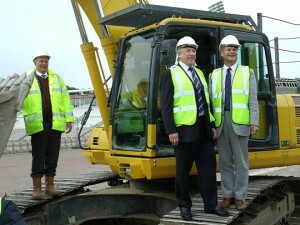 Hampshire County Cricket chairman Rod Bransgrove and Council Leader Keith had taken part in the ground breaking ceremony in 2012 and were once again on hand to see the doors open for business for the first time. 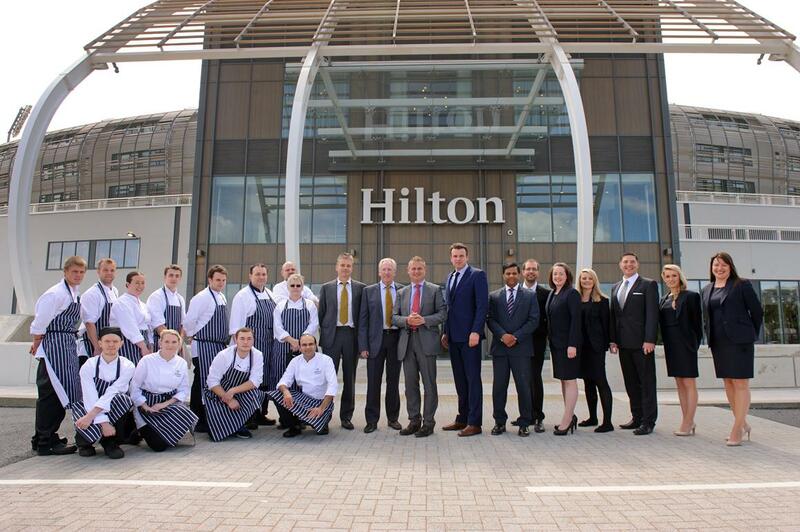 The Council’s investment in the Hilton at the Ageas Hotel and conference facilities is set to provide hundreds of jobs and provide a major contribution to the local economy. Offering a wide range of quality leisure facilities, the exciting new 4 star Hilton Hotel and Spa also boasts the largest conference and banqueting facilities on the south coast between Bournemouth and Brighton and is set to attract guests from far and wide. The council press release described the hotel as a “jewel in the borough’s crown” and Eastleigh News understands that the council has now handed over the £27 million it agreed to pay for the completed building. The hotel features 171 bedrooms offering a view of the cricket pitch, or 18 hole golf course which opens next year; together with an indulgent spa facility. The ‘eforea spa’ is the first of its kind in southern England and includes ten treatment rooms, eight heat experiences, a deep relax area, ice wells and a hydrotherapy pool. The hotel also features a restaurant with exquisite food and tempting cocktails, together with the Lakeside bar and roof terrace where visitors can enjoy a meal and relaxing drinks. As well as its fantastic leisure facilities, the new hotel comes complete with one of the largest and most versatile corporate and banqueting spaces in the region. The ballroom can cater for up to 700 guests making it an ideal venue for large weddings, exhibitions or private functions. “This is a momentous day for the Ageas Bowl and the culmination of more than 10 years of blood, sweat and the odd tear. “I am immensely proud of the dedication and commitment of all of those who have stuck with the project and seen it over the line, including Eastleigh Borough Council. Congratulations to everybody concerned on completing the project. Please could the Borough Council issue regular reports on how much revenue is being generated by the facility and how much it is costing us to service the loan, maintain the facility etc. It is important that the people of Eastleigh can now see whether this was a wise decision or not. Honest & accurate figures only please. No cover-ups…! Wishful thinking I fear ! I’ve challenged and asked numerous questions since the first announcement made that the Cabinet had agreed to the request from ‘Rose Bowl’ to loan them £30 million pounds to build their hotel. The Council were advised fairly early on that such a loan was unlawful. The twisting and turning to get around the restrictions,and the time ,effort and expertise spent by the Council on this one project in doing so, has been in my view staggering! The fall back position taken as to why the Council can not be fully transparent in regards to agreements reached, be they financial or otherwise,has often been ‘commercial confidentiality’. Many a public Council meeting has seen the subject declared Exempt Business. It has apparently always been decided that it was not in the Public interest that the release of such information was in the Public interest, hence the exclusion from meetings! Going forward, the Council Leader and his team will , as they have already done so , pour millions and hundreds of thousands into the project to Try and ensure it doesn’t fail. The Councils role, and the fact it’s often labelled as a Community Project, allows for it not to have to be commercially profitable ! No wonder the Rose Bowl Chairman heaps praise on the Councillors for their vision,. . . oh yes, and our money! None the less, the hotel’s up now, so I guess one should want it to thrive. At least with another couple of Lib Dem Councillors off the full Council, it will allow for just a little more scrutiny and challenge to decisions made and information provided. From my witnessing of events,this has too often been sadly lacking..
Hmmm, a quick count of the jobs created in the photo show only 18 new jobs.. The other four in the picture are not employed at the hotel. Its only been two weeks since the election and already the Fib Dems are spinning their lies. Will they never learn..? ?